The other day I received a copy of Jerry Beck's new book, The 100 Greatest Looney Tunes Cartoons and was asked by the publisher if I might offer up a review. 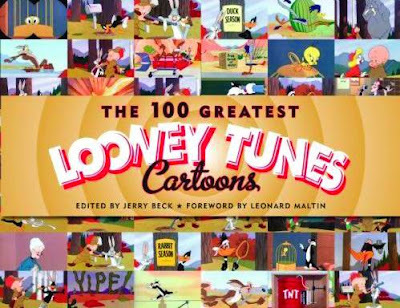 The book presents a sampling of 100 cartoons that Jerry believes are among the studio's best work, although he himself admits there are so many more that are equally as worthy in various ways. All 100 cartoons are pictured and titled alphabetically in little frame grabs at the beginning of the book for easy reference when searching. As I scanned these 100 titles, I estimated that I'm quite familiar with about 50% of the cartoons, and have seen about another 25% at least once, though am less acquainted with them. But there's certainly a number of cartoons that I don't believe I've ever seen at all. I mention this because I make no claim to know the Looney Tunes library anywhere near as well as Jerry Beck does, therefore I will not attempt to compete with his more informed opinion on the films themselves. The book is interesting both for what it is and what it is not. Let me address the latter part of that statement first. The book is not an authoritative, in-depth analysis of the cartoons, and those expecting as much may be disappointed. If that is what you seek, then you'd be far better off reading Leonard Maltin's Of Mice and Magic or Mike Barrier's Hollywood Cartoons, both of which go into great detail on select notable cartoons from all of the studios of that Golden Era, Warners included. If you want to limit your reading to just the Looney Tunes cartoons, I'd also recommend Steve Schneider's That's All Folks! and Joe Adamson's Fifty Years and Only One Grey Hare (Bugs' films only). But this new book by Jerry Beck is really not attempting to be such an authoritative tome as any of those titles. This book is more like a book version of a sampler record album. I used to buy a number of such records (and later, CDs) back when I was trying to gain more knowledge of both the jazz and classical music worlds. These albums offered up a sampling of various jazz musicians or classical composers' works that served as a good primer for the newbie listener. Once introduced to various artists through the popular selections of their work, you could then go forth and explore in greater depth that which appealed to you by purchasing complete albums of their music. For a novice cartoon buff, I believe that this book of Jerry's would serve a similar role as a simple and colourful introduction to these brilliant cartoons. But that's not to say that its appeal should be limited to the novice, by any means. I believe the ideal use for this book is as a companion guide in conjunction with the six volumes of Looney Tunes Golden Collection DVD boxed sets that are currently available to the cartoon buff (which of course, Jerry Beck was also instrumental in bringing to us). As one who has all six sets but admittedly has only watched a few discs and individual titles scattered throughout the whole series, this book makes me want to search out some of these cartoons I've never seen before, most of which are included among the six volumes. Each entry in Jerry's book contains a few stills from the particular cartoon, which is enough to whet one's appetite to seek out individual titles to watch. As I said, the book is not meant to be an in-depth look at the 100 Looney Tunes cartoons that it profiles. Each title receives just a double page spread consisting of a few stills, a short synopsis, and a brief commentary provided by Jerry or one of his 30 associates within the animation community, including Mike Barrier, Eric Goldberg, John Canemaker, to mention a few. (Even my friend and Sheridan colleague, Mark Mayerson is featured). If I have one criticism, I'd have suggested dispensing with the synopsis, as much of the cartoon plot is repeated in the commentary. It would have been better to have allowed a bit more room for personal thoughts on each title instead. As I perused all of the titles that Jerry has judged to be among the top 100, I must admit that all of my favourites were included, such as The Rabbit of Seville, One Froggy Evening, High Diving Hare and the rest of the usual suspects. I was also glad to see the inclusion of such unique cartoons as The Three Little Bops and the giddily disturbing Chow Hound. I might question the inclusion of Page Miss Glory, which, aside from the interesting art deco approach, is a cartoon that I suspect is an acquired taste for most viewers. Likewise, I would definitely not consider Hollywood Steps Out to be even a good cartoon, let alone a great one, as all it has going for it is the caricatured movie stars of the time, many of whom would not be recognized today. That novelty aside, the cartoon is poorly scripted and largely unfunny. While the Roadrunner cartoons only rate a couple of entries, and rightfully so, I am perplexed as to why there are no titles featuring Pépe Le Pew and just one with Foghorn Leghorn, as several of the Foghorns in particular are brilliant. Still, taken as a whole, I'd have to say that Jerry Beck has done an admirable job of distilling the entire library of Warners' shorts into this collection of just 100 titles. The 100 Greatest Looney Tunes Cartoons is available for just $24.95 U.S. and, while a bit more than the four bits to see Fearless Freep, is certainly a bargain at that price. A fun and nostalgic read, if not an overly informative one. A few weeks ago I put up a few pics taken on my vacation in Las Vegas with my Mom. We saw three shows while we were there, but only one of them I quite liked, the other two I found a bit disappointing. These were smaller shows, not featuring the big name headliners. Although in my opinion, Vegas headliners sure aren't what they used to be, as I really had no great inclination to see any of the name performers who are currently playing there. I sure do wish I'd seen Vegas back in the day when Frank, Dean, Sammy and all of their contemporaries held court. I reckon I was born too late. Ironically, though, just several days after returning home from vacation, Mom and I went to see an entertainer at Mississauga's Stage West dinner theatre that would be a terrific choice to see headlining a show in Vegas. 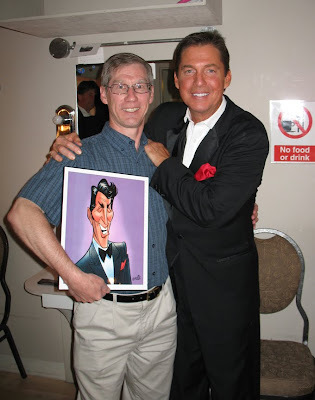 Ricci Martin is the son of Dean Martin, and for a few years now he has been doing a really lovely tribute to his famous Dad on stage, singing many of Dean's big hits accompanied by a small band. Don't misunderstand, though, as he's not attempting to impersonate his Dad in any way, like you see in those Rat Pack tribute shows. Ricci is blessed with a fine singing voice that is uniquely his own, and so his interpretations of Dean's songs are not trying to compete with his memory. This was the third time that Ricci had performed here, and so I've also gotten to know Tony Busseri of ARB Productions who is the fellow who has brought in not only Ricci Martin, but other terrific performers I've gotten to see like Bobby Rydell and the legendary Al Martino. Thanks to the generosity of Tony and his business partner Stan, I was able to go backstage after the show to present Ricci with the caricature I did last year of his Dad. I know Ricci was quite thrilled with the gift and was kind enough to pose with me for a photo. We were able to chat for awhile about Dean, Frank and that Golden Age of entertainment that I love so well. I really hope Ricci will come back to perform for us again here in Mississauga, and I heartily recommend his show if he plays in your area too! Today is the birthday of Genevieve Bujold, one of Canada's most celebrated actresses from Montreal, Quebec. Genevieve first gained great acclaim portraying Anne Boleyn in the 1969 film, Anne of the Thousand Days, opposite Richard Burton as King Henry VIII. 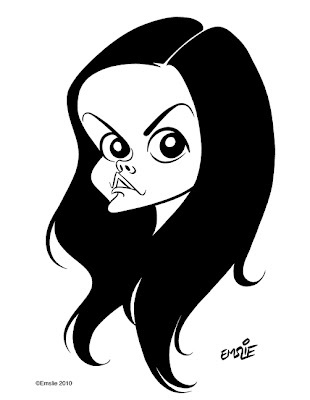 I drew this caricature for the ISCA forum where members draw the celebrity of the day as determined by their birthday. As it happens, July 1st is also Canada Day (AKA Victoria Day), so it seemed rather appropriate to acknowledge our national holiday with this pic of lovely, dark eyed Genevieve.